Hi fellow peaches! If you're reading this post via a reader, I urge you to click over because my sweet blog has undergone a little makeover. Who doesn't love a good makeover? It's been in the works for a while now and I couldn't be happier with the changes made by this lovely lady. I kept my old peachy logo as it's near and dear to my heart but Kelly added the nav bar and social media icons to streamline the look and hopefully make it easier for y'all to find your way around and connect with me. There are still a few kinks that need to be worked out but it's getting there! In other "shiny and new" news, I spent Saturday polishing some silver which was long, long overdue. You can see my son staring at the tea set with complete adoration in the photo above. 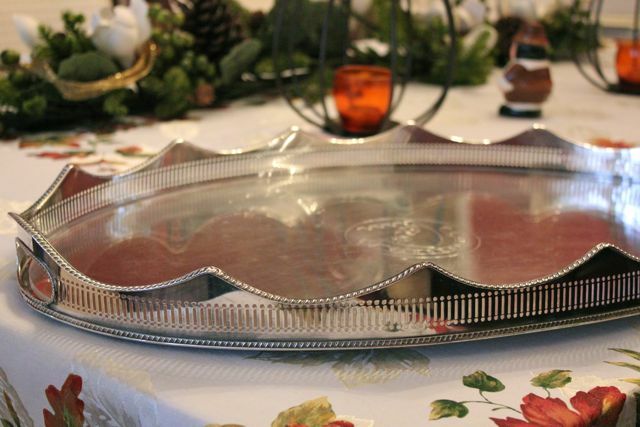 This large oval tray also got a makeover and is ready to house some Thanksgiving beverages and wines. Are any of y'all hosting Thanksgiving this year at your house? Are you already in the preparation phase or is it still too far out for you? So pretty! 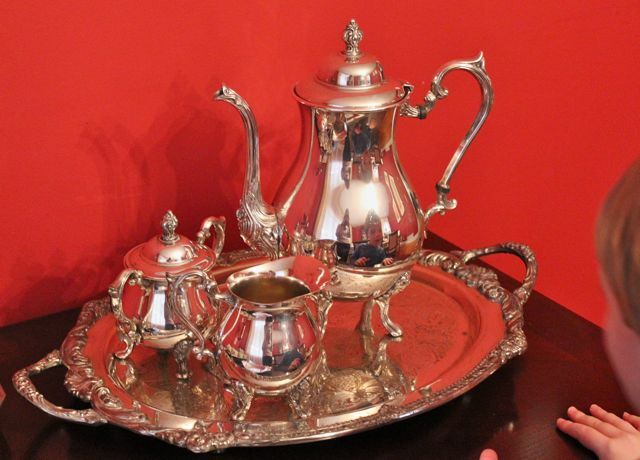 I love a shiny antique tea set. Another family member is hosting our Thanksgiving this year, which I am kind of bummed about because I love hosting! But, its less clean up and we are hosting Christmas for sure! Looks great! We're having Thanksgiving at our house for just us, so we haven't decided exactly what we want to do- traditional or something different! Have fun with your preparations! We are hosting my parents and no I am not ready. I still need to buy the bird. I can't believe it is already here. Your blog looks really great! Your silver is beautiful! I just added a silver beverage tray to my Christmas list. They're always so festive! Loving the new look! It's awesome! And yes, we are having Thanksgiving at my parents house! Should be fun! Love the changes... and the tea service! New site looks absolutely lovely. Congrats!